Welcome to Madison County Ag Auction! In 1997, Mike and Julie Hamilton opened the Madison County Ag Auction (MCAA). In the auctions earlier years, not only did we have weekly hay and straw auctions, but also monthly horse sales, an annual machinery consignment auction, and an annual Christmas Toy auction. 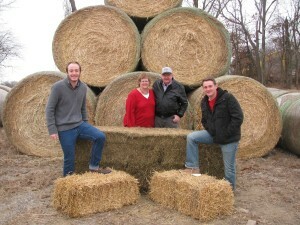 Today, the Hamilton’s devote all their auction time to Hay and Straw. Auctions are held weekly starting the first Saturday in December through the first Saturday in April. Sales start at 11:00 a.m. sharp. Madison County Ag Auction is a family owned business and strives to promote excellent customer service. We sincerely appreciate your business. This site is dedicated to Joseph D. Stutz (June 10, 1988 - July 10, 2010) Joe was a valued employee and dear friend of the Hamiltons. Joe left us way too soon. He is forever in our hearts and will always be watching over our hay auction.